Choosing a semicustom design can cut costs without sacrificing quality. We offer numerous projessional designs that can be tailored specifically for your business it comes down to a simple 4 step process. Choose Your Design. View Designs. First, choose your design. 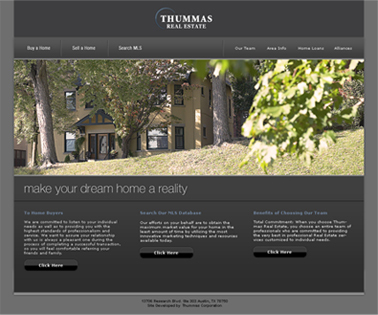 Dallas MLS Integration can be added to any semi-custom design or to a fully custom design. For this example, we have created a fully custom site with upgraded integration. Next, let us know the areas of Dallas that you focus on and that you would like to have listed on your site. Basic MLS Integration includes 5 areas. Upgraded Integration can have up to ten with an added fee for each additional area. In less than 5 business days you will have full MLS integration tailored to your needs and customized to your website. Clients can save images of homes that they love with an id and password. They can also print brochures of their favorite homes. For a small additional fee, you can have an automated email that gets sent to them when homes matching their criteria become available. 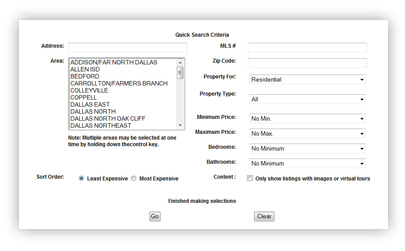 Any real estate agent in Dallas should have this feature on his or her website to maximize buying possibilities and to make their site vital to their clients. Click Here or on the image below to see the Dallas MLS Integration in action!